The saga of uber-creationist Ken Ham’s Creation Museum continues, and it isn’t looking good for him or his followers. If you recall, Ham and his creationist organization Answers In Genesis (AiG) have, in recent years, gone all-in on an investment scheme to fund what they call a life sized replica of Noah’s Ark named Ark Encounter. For years, I and others have reported on the continuing financial troubles and ethically questionable revenue sources for Ken Ham’s enterprise, and now things seem to only be getting worse for Ham, AiG, and the Creation Museum. Back in February, there was a big debate between Ham and Billy Nye the Science Guy at the Creation Museum; after the debate, Ham reported that this debate had brought in a huge amount of much-needed financial support for Ark Encounter and that construction would begin on the much publicized project in May of this year (after repeated delays due to insufficient funds). At the time, I and others were skeptical, speculating that perhaps Ham wasn’t being completely truthful because while he said money was coming in, he didn’t provide any specifics. This led me to believe that Ham was continuing his habit of not only bending (or breaking) the truth on issues of science but those of economics and finance as well. The main problem with Ham’s overtly religious pet project is it seems to be a magnet for taxpayer dollars. First, Kentucky officials committed more than $40 million in tax incentives to the Ark Park. Sadly that was just the beginning. Later, the Kentucky legislature planned to spend $2 million on a road project in a rural area, seemingly for the sole benefit of the proposed Ark Park. But even those generous incentives weren’t enough for misguided lawmakers. The city of Williamstown, which had already granted a 75 percent property tax break for the park, decided last year that it would sell $62 million in municipal bonds on behalf of AiG affiliates. All told, various government entities in Kentucky have planned to give the Ark Park, which was originally supposed to cost about $175 million, an astounding $100 million (or more) in various types of public support. Recent reports, however, cast serious doubt on just how much of that money, if any, will reach the project. Then in late August 2011, AiG bumped the timetable way back, saying groundbreaking would begin in the spring of 2012. That did not happen, either. Louisville’s LEO Weekly reported last week that the large tax incentive package promised to the Ark Park back in May 2011 by Kentucky’s Tourism Cabinet came with one little catch: an expiration date. The agreement says that AiG can receive a 25 percent tax rebate on the cost of construction once the park opens, provided construction began by May 2014. The discount would be capped at $43 million. Gil Lawson, a spokesman for the Tourism Cabinet, told LEO Weekly that Ark Encounter quietly withdrew its old application for a $172 million project on March 28 and instead submitted a $73 million proposal. If that application is approved, and if it is built within the allotted timeframe, that would mean AiG is eligible for $18.25 million in tax incentives, LEO Weekly said. But the shrinking tax package doesn’t appear to be Ham’s only problem. In April, the Cincinnati Enquirerreported that the local road improvements needed to handle all the traffic that will supposedly rush to Ark Encounter (if it ever opens) will be pushed back to 2017. That’s a bit of a problem for Ham, who last claimed that the park would open in the summer of 2016. Perhaps he wants park visitors to have an authentic Bible experience by walking or riding camels to see the ark. There is also some mystery surrounding the $62 million in municipal bonds that supposedly rescued Ham’s project. The Louisville Courier-Journal reported in January that while $26.5 million in bonds had been sold, the city needed to sell an additional $29 million by Feb. 6 or else those who already bought bonds would be able to collect on their investment immediately. The city would not say exactly how much money was raised, the Courier-Journal reported in late February, but AiG’s website claims the bonds actually yielded $73 million. AiG also claims it has raised $15 million on its own. Hmm… when “there is some mystery” about how public funds are allocated and being used, especially on a legally and ethically questionable project such as this, then that’s kind of a problem. KY lawmakers and politicians would be wise to distance themselves from this slow-motion train wreck. But there’s more! 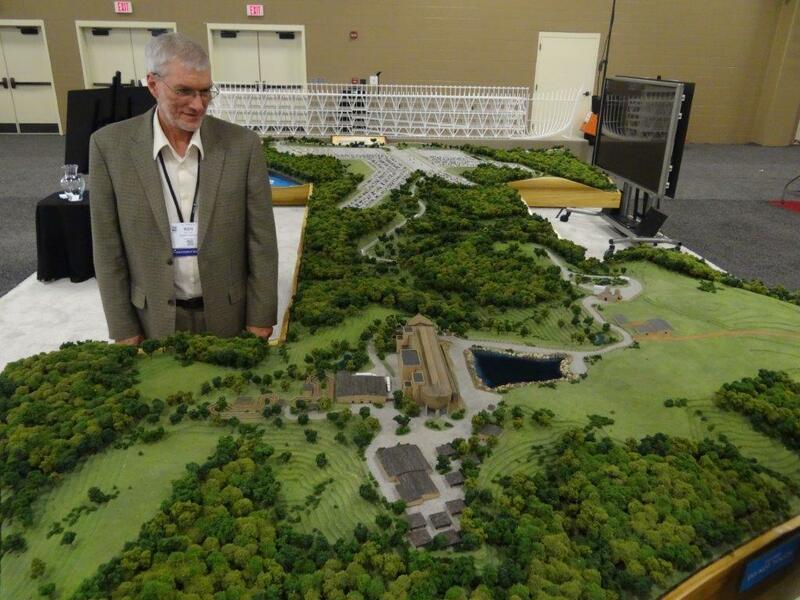 It is now June, and it remains unclear whether or not construction has actually started on Ark Encounter. AiG’s website says its “construction management team” is still soliciting bids from contractors, suggesting that no real progress will be made anytime soon. Whoops! I thought that “construction” meant that earth-moving machines were actually, I don’t know, moving earth and digging holes and that carpenters were actually nailing pieces of wood together and so on. Apparently, in Ken Ham’s universe, “construction” means… something else. Well, one thing is for sure: this story won’t end here. I think Ken Ham is going to try to string both investors and politicians alike along for as long as possible on his sinking Ark Encounter, despite the fact that it should be obvious by now to any reasonable observer that his grasp of finances is about as trustworthy as his grasp of science. Too bad for the folks who invested in this debacle that they didn’t use a little evidence-based thinking. That’s what you get for faith-based investing, I suppose. Continued Financial Trouble for KY Creation Museum? 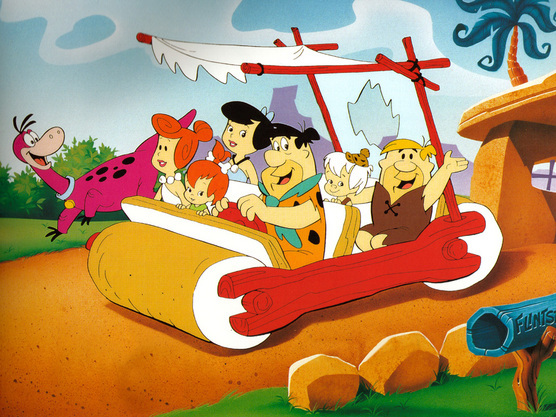 Ken Ham’s Creation Museum is back in the news, and – surprise – it has to do with a questionable funding proposal to finance his floundering theme park, where people can pay to be told that the Flintstones is the real thing. A city in Kentucky is working with Crosswater Canyon, an owned subsidiary of Answers in Genesis, Inc., to offer $62 million in securities for prospective investors to help aid the completion of a Creationist theme park and replica of Noah’s Ark. While the city of Williamstown is issuing the bond, Crosswalk Canyon is solely responsible for the bonds, not the city. Beginning next month, Williamstown may oversee the amount of taxable securities for investors to the project overseen by Answers in Genesis, reported Brian Chappatta and Priya Anand of Business Week. … Unlike the Creation Museum, the Ark Encounter project has had its share of financial issues regarding funding and donations. The official ground-breaking for the project has been delayed multiple times since 2011, with private donations not matching the necessary monetary benchmarks. … Answers in Genesis’ efforts in Kentucky have garnered their share of criticism, including from the Washington, D.C.-based group Americans United for Separation of Church and State. In the past Americans United has criticized the alleged First Amendment issues with regards to the state support for projects that benefit the Creation Museum and the Ark Encounter. Alex Luchenitser, associate legal director at Americans United, told The Christian Post that the bond offering is one of many examples of government aid proposed for the Ark Encounter project. “The imminent bond offering is only one of several different kinds of aid being given to the Ark Park by the State of Kentucky, Grant County, and the City of Williamstown,” said Luchenitser. This is about an article at the website of Bloomberg Businessweek. Business Week was formerly an independent magazine, now it’s part of the Bloomberg international news agency, headquartered in New York. Their article is Noah’s Ark Depends on Faith in Default-Plagued Debt: Muni Credit. From our recent post, Ken Ham’s “Ark Encounter” Bonds, you already know about the bonds being issued to finance the proposed Ark Encounter project, which is owned by a company controlled by Answers in Genesis (AIG). AIG is the on-line ministry of Ken Ham (ol’ Hambo), the ayatollah of Appalachia. It also owns and operates the infamous, mind-boggling Creation Museum. “Given the default history of unrated municipal debt, investors may have to pray for the success of bonds being sold to build a full-scale replica of Noah’s Ark. Ouch… but what the heck does Bloomberg Businessweek know? Sure they may have oodles of financial and investment expertise, but if creationists have shown us anything it’s that they don’t need no stinkin’ experts who spout off about pesky things like evidence and facts! 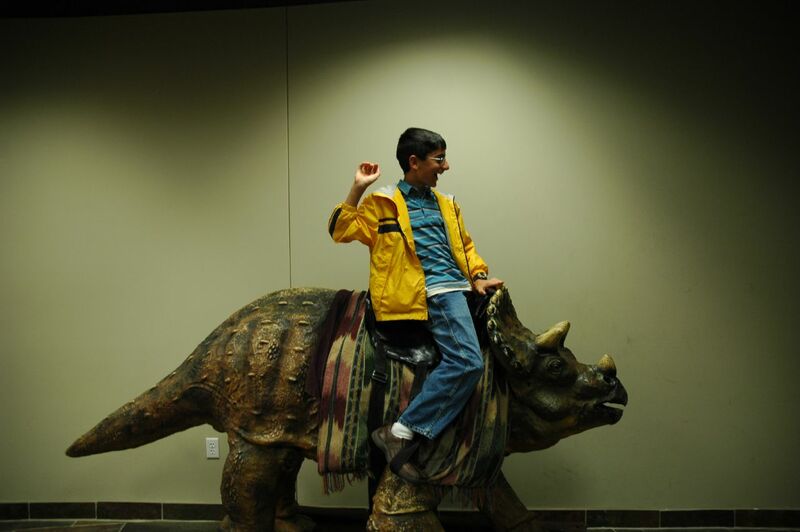 On Memorial Day weekend this year, the Creation Museum celebrated its sixth year of operation. Entering our seventh year, crowds have been continuing to flock to the Creation Museum. This past Friday and Saturday, we saw over 3,500 people visit the Creation Museum! Thus far, attendance is ahead of projections for this year and ahead of last year. I’ve included a few photographs of some of the people who visited this past Friday. At a few times on Friday, lines were out the door—but our very capable staff was able to get visitors into the museum quickly. The new zip lines have also proved to be extremely popular—and in the near future, two super zip lines around 1700 feet long, plus an obstacle course and a special children’s course, will also open. Ham goes on to list a lot of things which he claims are new displays and “research” to his museum, presumably to bolster his argument that things at the Creation Museum are going just fine. However, a more thorough analysis of the Creation Museum’s publicly available finance reports for the last few years – which you can find at http://pandasthumb.org/archives/2012/12/pts-year-end-re.html – seem to disagree with the overly rosy picture that Ken Ham insists upon painting. When you go from a surplus of $2.1 million to a deficit of $540,000 in three years time, it’s not good financial news. Reporter James McNair recently reported in a Cincinnati newspaper that the attendance at the Creation Museum has dropped for four consecutive years and that Answers in Genesis lost over $500,000. These tidbits inspired my colleague Dan Phelps and me to look at AIG’s Forms 990. These are tax forms that must be submitted by nonprofit organizations to the US Internal Revenue Service and may be found if you have a (free) account on GuideStar. The 2010 Form 990 (for fiscal year ending June 30, 2011) has some interesting information. 1. The president of AIG, Ken Ham, earned an annual salary of approximately $150,000 and a total package of around $200,000, which I think is not out of line for the president of a company with approximately $20 million of revenue (Schedule J, Part II). Four of Ham’s children, his son-in-law, his brother, and his sister-in-law are listed as staff members, with annual salaries between approximately $1300 and nearly $80,000 (Schedule L, Part IV). 2. AIG says that Crosswater Canyon, a nonprofit, will operate AIG’s Ark Park but that a limited-liability company will own it. Crosswater Canyon is identified in Schedule R as being wholly controlled by AIG; we assume that means it is a subsidiary. According to Whois, crosswatercanyon.org is one of approximately 1300 domain names owned by AIG, but crosswatercanyon.org, .com, and .net yield nothing useful. Crosswater Canyon reimbursed AIG a bit over $1 million for expenses. The Ark Park was formally announced in December, 2010. The payment was made some time between then and June 30, 2011. AIG was thus reimbursed $1 million for expenses within six or seven months of the announcement. 3. Schedule R, Part III, lists Takenbac Enterprises, LLC, PO Box 384, Hebron, KY 41048 as a “related organization taxable as a partnership.” Two of the officers of Takenbac Enterprises are “key employees” of AIG and draw annual salaries of approximately $90,000 from AIG. We speculate that Takenbac is the mysterious “private Limited Liability Company (LLC) [that] will own the Ark Encounter,” according to AIG’s FAQ’s. 4. Geo-Research Pty., Ltd. [proprietary company], 27 Rising St., Shailer Park, Queensland, Australia, received $128,000 for consulting (Part VII). Geo-Research is or was the employer of Andrew Snelling, a former geologist who joined the staff of AIG in 2007. The address of Geo-Research appears to be a private home that has been for sale but is now off the market. Yet despite all of this evidence, Ham and his followers – many of whom, ironically, challenged me to examine the publicly available financial reports – keep on saying that all is well. Of course, none of this surprises me. That’s because if you make it part of your worldview, as many creationists do, to deny evidence and reality, is it any wonder that the true believers among creationists are not willing to acknowledge the troublesome finances which are plain to see for any who care to look? Creation Museum Running Out of Cash and Going Extinct? In an interesting, though not very surprising, development, it seems the Creation Museum in Kentucky is running out of money. And it seems the problem is that, like creationism itself, there is nothing new or different about the exhibits at this “museum”. The irony is that Ken Ham and other creationists claim the Creation Museum is doing scientific work which proves creationism to be true, yet since the place opened 5 years ago nothing has changed and no new “creation science” research has appeared. Zovath’s response to the museums critics who wonder how zip lining fits with their message? Wow… so the Creation Museum, once-heralded as the bane of modern evolutionary science and other wickedness, is starting down the road of turning into a Bible version of Disneyland. I just have to chuckle at this turn of events, because it seems as if, by failing to change and – dare I say – evolve thereby adapting to its economic situation, the Creation Museum may very well go extinct.